YOU Get It First is accelerating the messaging industry with innovative technology to help control the flow of information in your life. Our groundbreaking features and affordability provide a clear means for you to broadcast and receive the information you want. 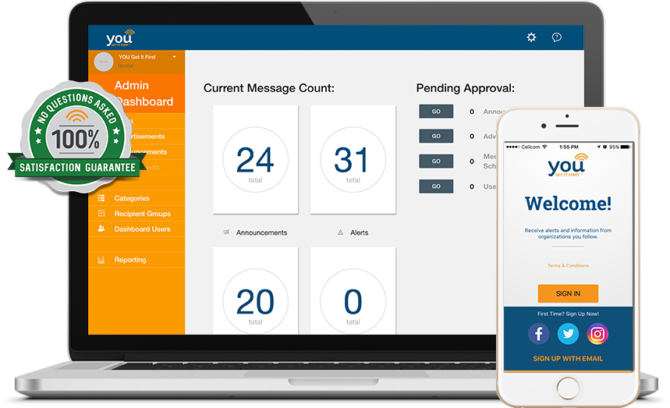 Combined with our exclusive patent-pending Threat Alert features, YOU provides safety and security in a simple, reliable platform for any organization. Compare YOU features and functionality to leading competitors below. Industry-leading technology meets affordably priced protection. Can add detail to threat template prior to send. Students achieve their fullest potential through inspiring learning environments that are both safe and secure. Whether they are entering kindergarten or completing their bachelor degree, the YOU Threat Alert System helps educational facilities achieve the safest learning environment possible by placing real-time technology on your side. When combined with an aware and prepared educational staff, the YOU system empowers school administrators, teachers, students and the community to achieve a new standard in safety.